It has been a while since I posted here…but we need data. Human, primary cells were our biggest sellers in 2016. Most can be passaged 6+ times so users have been able to build healthy stocks. In searching for new business, I am learning that many labs need more data in order to determine if our cells will work for them. This has resulted in our Desperately Seeking Data. Just email us any data generated using our cells and we will email back a 25 USD Starbuck’s Gift Card. Here’s an example of customer data provided as part of this campaign. Just email me your data pshuster@neuromics.com and we will email back the gift card. Dysregulated bursting is at the root of many motor neuron/neuromuscular junction disease. 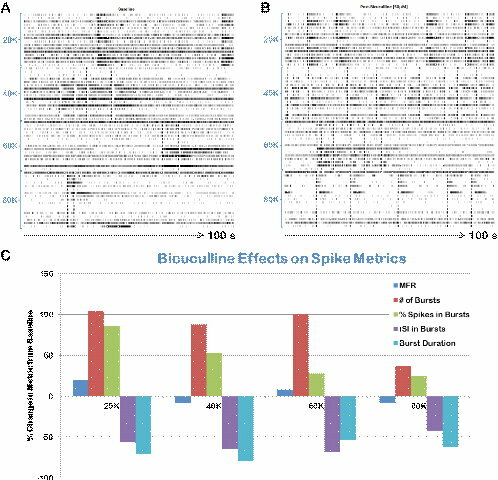 ArunA Biomedical teaming with Axion Biosystems have generated relevant bursting data from our Mouse Motor Neurons cultured on Axion-Bioystem’s Maestro MEA. We will continue providing you content we believe important. Should you have questions, do not hesitate to contact us. Thank you and we stand ready to serve you and your team. Dr. Cesar V. Borlongan, University of South Florida and a team of researchers have successfully identified DJ-1 as a potential therapeutic target for treating stroke. They used our hNP1TM Human Neural Progenitors to confirm the neuroprotective properties of the DJ-1 protein: Yuji Kaneko, Hideki Shojo, Jack Burns, Meaghan Staples, Naoki Tajiri, Cesar V. Borlongan, DJ-1 ameliorates ischemic cell death in vitro possibly via mitochondrial pathway, Neurobiology of Disease, Available online 21 September 2013, ISSN 0969-9961, http://dx.doi.org/10.1016/j.nbd.2013.09.007. •DJ-1 translocation was assayed in oxygen–glucose deprived human neural progenitor cells. •Immunofluorescent microscopy and ELISA were used to measure DJ-1 translocation. •DJ-1 translocated preferentially into polarized mitochondria. •DJ-1 translocation is associated with the preservation of functional mitochondria. •DJ-1 exhibits antioxidative stress effects following ischemic stroke. I will continue to post updates on Research success with our Cell Based Assay Solutions. There is a great demand for an easy way to generate human astrocytes in culture. I am pleased to present a protocol for differentiating our hNP1 Cells to Astrocytes. This comes from my friend Dr. Steve Stice and his team at ArunA Biomedical and University of Georgia: Majumder A, Dhara SK, Swetenburg R, Mithani M, Cao K, Medrzycki M, Fan Y, Stice SL. Inhibition of DNA methyltransferases and histone deacetylases induces astrocytic differentiation of neural progenitors. Stem Cell Res. 2013 Jul;11(1):574-86. doi: 10.1016/j.scr.2013.03.003. Epub 2013 Apr 2. These enriched non-transformed human astrocyte progenitors will provide a critical cell source to further our understanding of how astrocytes play a pivotal role in neural function and development. Human neural progenitors derived from pluripotent embryonic stem cells and propagated in adherent serum-free cultures provide a fate restricted renewable source for quick production of neural cells; however, such cells are highly refractive to astrocytogenesis and show a strong neurogenic bias, similar to neural progenitors from the early embryonic central nervous system (CNS). We found that several astrocytic genes are hypermethylated in such progenitors potentially preventing generation of astrocytes and leading to the proneuronal fate of these progenitors. However, epigenetic modification by Azacytidine (Aza-C) and Trichostatin A (TSA), with concomitant signaling from BMP2 and LIF in neural progenitor cultures shifts this bias, leading to expression of astrocytic markers as early as 5days of differentiation, with near complete suppression of neuronal differentiation. Images: Morphology and gene expression after 15 and 30 days of differentiation of cells with astrocytic treatment. 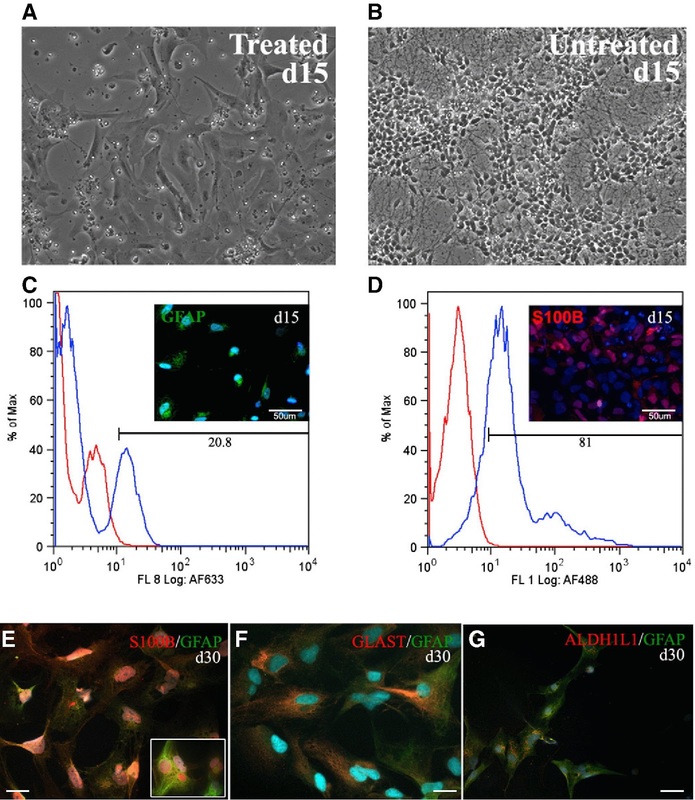 Bright field images of hNP cells differentiated (A) with or (B) without astrocytic treatment. A and B compare morphology of cultured cells in treated vs. untreated differentiation at 15 days. Treated and untreated cells were cryopreserved at d6 and subsequently thawed and cultured for an additional 9 days. Flow cytometry analysis to determine percent of GFAP+ and S100B+ cells at d15 of differentiation. Data is presented as histograms for (C) GFAP and (D) S100B with corresponding immunoreactive cells in insets from a parallel culture. Immunocytochemistry detects expression of (E) GFAP with S100B (inset showing distinct staining for both markers), (F) GFAP with GLAST, and (G) GFAP with ALDH1L1 at d30 of differentiation. dissociated with Accutase™ and frozen in differentiation media containing 10% DMSO. Viability was assessed at 30 days in Aza-C and TSA treated cultures by trypan blue exclusion, and datawas acquired using a Cellometer Auto T4® (Nexcelom Biosciences). I will keep you updated on new differentiation protocols for our potent, pure and widely used hNP1 Human Neural Progenitors to new phenotypes. I have been promoting Dr. Steve Stice and his team. They are the brains behind our hN2TM Human Neuron and hNP1TM Human Neural Progenitor Discovery Kits. I would like to share 2 recent publication referencing use of these discovery kits. These validate the postings on capabilities. They are the best solutions available for researchers searching for Neuron or Neural Progenitor Based Assays for basic research, toxicology studies or drug discovery. Abstract: Organophosphorus (OP) compounds represent an important group of chemical warfare nerve agents that remains a significant and constant military and civilian threat. OP compounds are considered acting primarily via cholinergic pathways by binding irreversibly to acetylcholinesterase, an important regulator of the neurotransmitter acetylcholine. Many studies over the past years have suggested that other mechanisms of OP toxicity exist, which need to be unraveled by a comprehensive and systematic approach such as genome-wide gene expression analysis. Here we performed a microarray study in which cultured human neural cells were exposed to 0.1 or 10 μM of VX for 1 h. Global gene expression changes were analyzed 6, 24, and 72 h post exposure. Functional annotation and pathway analysis of the differentially expressed genes has revealed many genes, networks and canonical pathways that are related to nervous system development and function, or to neurodegenerative diseases such as Alzheimer’s disease, Huntington’s disease, and Parkinson’s disease. In particular, the neuregulin pathway impacted by VX exposure has important implications in many nervous system diseases including schizophrenia. These results provide useful information valuable in developing suitable antidotes for more effective prevention and treatment of, as well as in developing biomarkers for, VX-induced chronic neurotoxicity. humidified 5 % CO2 for 48 h (without changing media) before VX exposure. Abstract: Although sensory neurons constitute a critical component for the proper function of the nervous system, the in vitro differentiation of functional sensory neurons from human stem cells has not yet been reported. This study presents the differentiation of sensory neurons (SNs) from a human neural progenitor cell line, hNP1, and their functional maturation in a defined, in vitro culture system without murine cell feeder layers. The SNs were characterized by immunocytochemistry and their functional maturation was evaluated by electrophysiology. Neural crest (NC) precursors, as one of the cellular derivatives in the differentiation culture, were isolated, propagated, and tested for their ability to generate sensory neurons. The hSC-derived SNs, as well as the NC precursors provide valuable tools for developing in vitro functional systems that model sensory neuron-related neural circuits and for designing therapeutic models for related diseases. Researchers discovered a more efficient, accurate and cost-effective way to conduct these studies using cells in a petri dish. I have multiple posting on Dr. Steve Stice and his work at ArunA Biomedical and UGA. He and his team developed our hNP1™ Human Neural Progenitor & hN2™ Neuron Discovery Kits and hMPro™ Human Mesenchymal Progenitors (hMPC) Kits. These kits are increasingly becoming important for basic human disease research and drug discovery. I am pleased to report here that he and his colleagues at UGA have developed a better way to study the effects of environmental toxins on fetal development. Franklin West and Steve Stice, animal scientists in the UGA College of Agricultural and Environmental Sciences, and Mary Alice Smith, a toxicologist in environmental health science in the UGA College of Public Health, began testing the efficiency of a technology West and Stice developed to measure the effects of environmental toxicants. They use cells that come from stem cells and represent the early cells that eventually will form sperm cells in adults. The cells are highly vulnerable to toxicants. Their findings were published recently in Toxicological Sciences: Franklin D. West, W. Matthew Henderson, Ping Yu, Jeong-Yeh Yang, Steven L. Stice, and Mary Alice Smith. Metabolomic Response of Human Embryonic Stem Cell–Derived Germ-like Cells After Exposure to Steroid Hormones. Toxicol. Sci. (2012) 129 (1): 9-20. doi: 10.1093/toxsci/kfs185. The new testing model fills a void left by current methods and provides human-specific results. “Using animal studies, you are looking at more than a year to test a chemical in rodents,” Stice said. “Using this test, we get results in two to three weeks at most and possibly shorter.” Considering the vast number of untested chemicals humans are exposed to, with new ones coming out every day, animal testing will never be practical to prioritize which chemicals need further testing, Stice said. There are more than 80,000 chemicals in the environment that haven’t been tested for human impact mainly because of the cost and time required using current procedures. The reliability of those results also must be considered. West first developed the germ-like cells during his doctoral work in Stice’s UGA laboratory. “Our next step with the cells is to test more chemicals and see what happens with more compounds,” he said. Stice also plans to use neural and bone forming cells he developed to test chemicals for developmental neurological and skeletal toxicology. Scientists at the Environmental Protection Agency already have demonstrated in peer-reviewed studies that these types of cells are very sensitive to known toxins such as lead and mercury. The team is now testing more chemicals on these cells. “If the assay is predictive and repeatable, the chemical industry will have better, faster and less expensive test systems and, as a result, will reduce the use of animal testing and experiments,” Stice said. “Testing more known chemicals for developmental toxicology will validate these assays for later use by the chemical industry. Our shared long-term goal is to ensure the health and well being of our children,” he said. I will keep you posted on progress on these assays. I anticipate commercially available assays will be an outcome of this important research.